The KilGogh Arts Festival is returning for the seventh year and this year we're taking the theme "Gogh Big or Go Home" seriously with the biggest festival yet! Starting with the Exclusive Preview on Thursday, March 28, from 7pm-10pm which offers ticketed guests first viewing of the art exhibits, the opportunity to meet and mingle with the artists, artist's seminars and demonstrations, wine, and cheese pairing with cheese from Scardello in Dallas, gourmet food stations and performances by local musicians. The annual KilGogh Art & Wine Exhibition is Friday, March 29 from 7pm-10pm in the Texan Theater and Old Post Office on S Kilgore St. in Historic Downtown Kilgore. Tickets will be $25 and are available to purchase online. This special event will provide attendees an evening of art, entertainment, food from the Kilgore College Culinary Arts and wine tastings from local East Texas wineries. For more info. or to purchase your ticket visit kilgoremainstreet.com/kilgogh Don't worry if you can't decide which piece to buy, come back on Saturday, March 30, when the art exhibition is open for free to the public from 10am-2pm. The KilGogh Arts Festival aims to provide an opportunity for local and regional artists to exhibit their art and make the festival an East Texas art experience for the community. 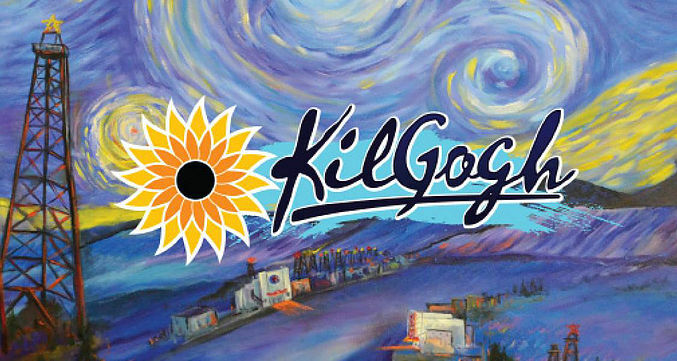 KilGogh attracts artists and visitors from across East Texas, the Shreveport/Bossier area and Dallas/Fort Worth region. Started by local art enthusiasts, this event has grown each year since its inaugural event in March 2013, and is now managed by the Kilgore Main Street program.